Everything's cuter in miniature form. Pie is so hot right now. Peanut butter cups are delicious. Well, I think we all know the answer to all three, and it's certainly not "false". But when these three truths come together in one adorable pocket pie form, they go beyond TRUE to TRUE LOVE. 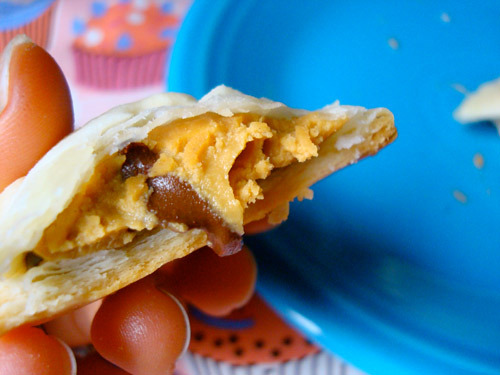 That's right: Peanut Butter Cup Pocket Pies! These sweet morsels are the perfect two-bite treat, and tasty as can be with the can't-lose combo of peanut butter and chocolate, all blanketed between two discs of rich, buttery pie crust. They'd be cute as pops too, but I think I actually prefer the stick-less version, because they're easier to "pop" in your mouth. Prepare a baking sheet by lining it with parchment; set to the side. Preheat oven to 400 degrees F.
Roll out your pie crust on a flat, floured surface. Using a 2-inch (or so) round cookie cutter, cut out as many rounds as you can. It's fine to use other shaped cookie cutters too, but keep it fairly simple (hearts, squares, flower shapes, etc) so that you'll be able to easily seal the pies later. Clump the remaining dough, re-roll, and try to get some more cutouts. If they're kind of ugly, it's ok--use these for the bottom layer of your pocket pies. Lay out half of the pies on your prepared baking sheet. Place a teaspoon of peanut butter in the center of each, leaving room on the perimeter so you can seal the second half of pie crust on top. Add 3-4 chocolate chips to each, pressing into the peanut butter. Using a small pastry brush, brush a small amount of egg wash along the perimeter of each of the peanut butter-filled pie bottoms. Place in the preheated oven; bake for 8-12 minutes, or until golden.